The 4/1 second favourite was always travelling kindly under jockey Nico de Boinville and the response was instant when asked for his effort, the pair scampering clear up the hill to record a seven length victory over 15/8 favourite Min. "He always looked to be in the right place and Nico's given him a lovely ride," said the trainer. "I was always happy - he is very good I think. I think between the two of them (Altior and Buveur d'Air, who finished a further length and a half behind Min in third), we had to win this race as it was our best chance and they've both run very well. "Although he wasn't favourite and some of the pressure has been on other trainers, you can never relax. This week is going to be tough as they are all good races but we had to win that otherwise it was going to be uphill all the way. Now there's a bit of downhill in sight. "We'll look at where we go next. We'll see how it goes and I won't rule Aintree out but we don't have to go there. He's had a good break though since Kempton on Boxing Day so he's come here a fresh horse. "There won't be much else for him though apart from Aintree and Punchestown. It's tempting but it's only three weeks between here and Aintree. When you don't need to, why head there? "Nico has given him a beautiful ride. He was always in the right place and had the confidence to take him where he wanted. I just always thought he was a proper horse. He looked it at Kempton and looked it here again. He worked at Kempton on the all-weather the other day and worked very well. "We've always thought he was seriously good. 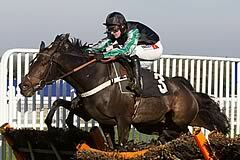 We've had some very good horses beaten in this race (My Tent Or Yours in 2013, Darlan in 2012, Binocular in 2008, while Sprinter Sacre was third behind Al Ferof in 2011) so it's nice to have one win for a change. "He does look smart enough to think about hurdling again next year but he will make a lovely chaser. I hope he's back here next year but doing what I'm not too sure at the moment." Prospects of a Willie Mullins-trained four-timer on the opening day of the Cheltenham Festival were dented when 15/8 favourite Min finished runner-up. The lightly-raced gelding had no answer to the more-experienced Altior, who screamed home by seven lengths for trainer Nicky Henderson. In third, beaten a further one and a half lengths, was Altior's stablemate Buveur d'Air, and a further four lengths behind was the Gordon Elliott-trained Tombstone. Mullins, who also ran Petit Mouchoir (eighth) and Bellshill (13th of the 14 runners - who all finished), said: "We knew that if Altior proved as good in this race as he has looked in previous races we were up against it, and it looks as though that is as good as Min is. They went fast and our horse settled, but he wasn't as good as the winner. "I was very pleased with Petit Mouchoir, who ran a fine race, but Bellshill was disappointing." Min's owner, Rich Ricci, said: "He ran his heart out, but the winner looks a very good horse. Our fellow travelled well, and made just one mistake down the back when he was a little bold, but he was beaten by a better horse, so well done to Nicky [Henderson]."